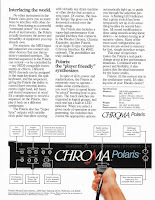 Rhodes Chroma Polaris "Polaris: Feel The Power" eight page barn-door fold colour brochure from 1984. There I was. 1985 I think. I was in my favourite music store eyeing up the Chroma Polaris. 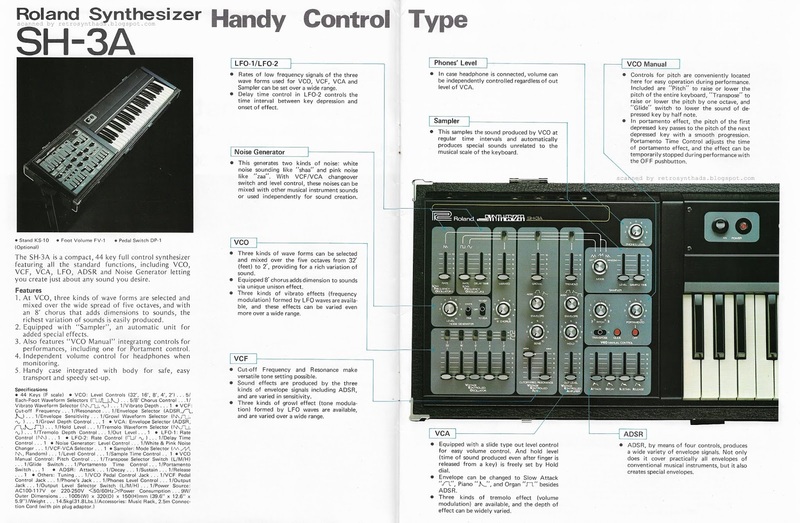 I'd put the idea of buying a car on the backburner for the sole purpose of saving up the cash from my job as a dietary aide at a near-by hospital to instead purchase this synth. At work, I can make decisions on the spot. But personal decisions have always required days, weeks or even years of mind-numbing procrastination. And this was a big one. So many different synths in the shop, but this was the one. Finally, decision made, I called over the worker bee and pointed to the Polaris. That one! So what did the sales guy say? "Hey, have you checked out this Casio CZ-5000. Its digital. It has a sequencer as well. And its cool looking. And... and... "
...and wouldn't you know it. Just like that I went home with the CZ. 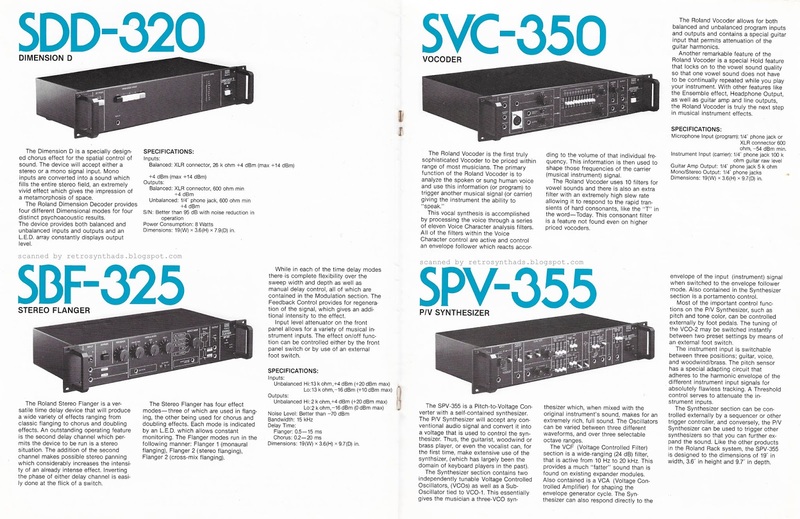 And as much as I love my CZ-5000 (I still have it!) 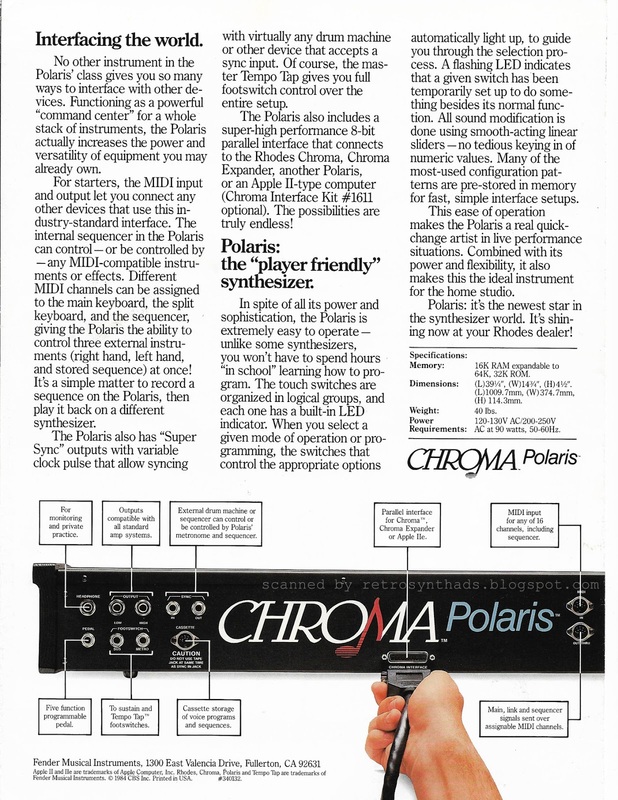 I had always wondered what it would be like to to own the Chroma Polaris, but over the decades I'd never managed to come across one. In *perfect* condition. Just like this brochure. I love this brochure almost as much as I love my Polaris - it's just full of surprises. 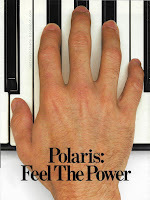 The cover is simple - just one big photo of a hand on a keyboard. 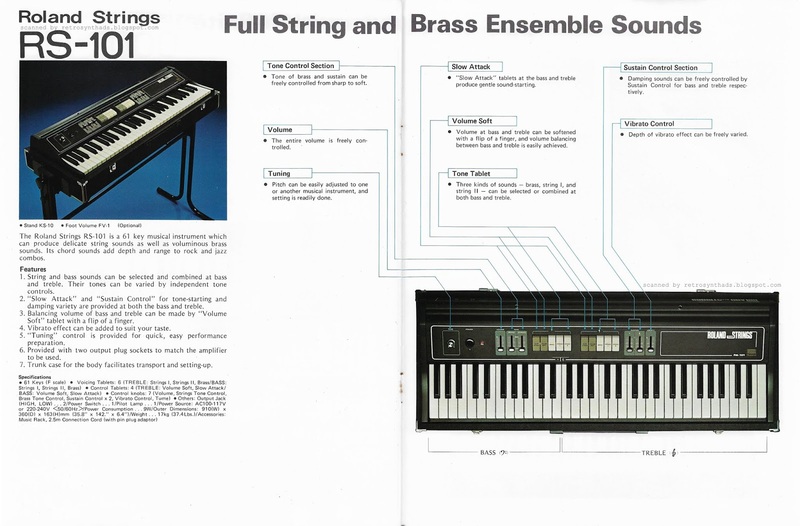 Gutsy move to not include an actual photo of the synthesizer on the cover of your brochure. Even if you flip it over to the back, all you see is the back of the synth. Interesting. But that's the point. Curiosity makes you instinctively want to open the brochure up. So, fold open the brochure and you come to two inside pages, each folded over from the outer ends, revealing that they too can fold out - the "gate fold" as its often called. Surprisingly, the title spans between the two pages. 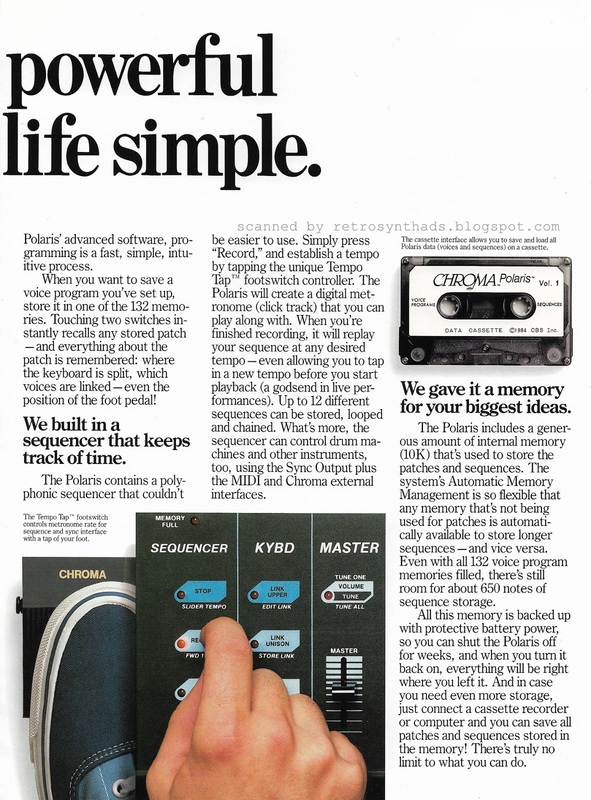 And even more surprisingly... although we get a lot more detail about the features of the Chroma Polaris, there is still no sign of a photo of the synth itself. But now... open those barn doors! Bam! There's your Chroma Polaris! Spanning not just one... not just two... and not even three pages. But FOUR PAGES. Now *that* is taking advantage of a gate fold. Observe and commit to memory, design kiddies! 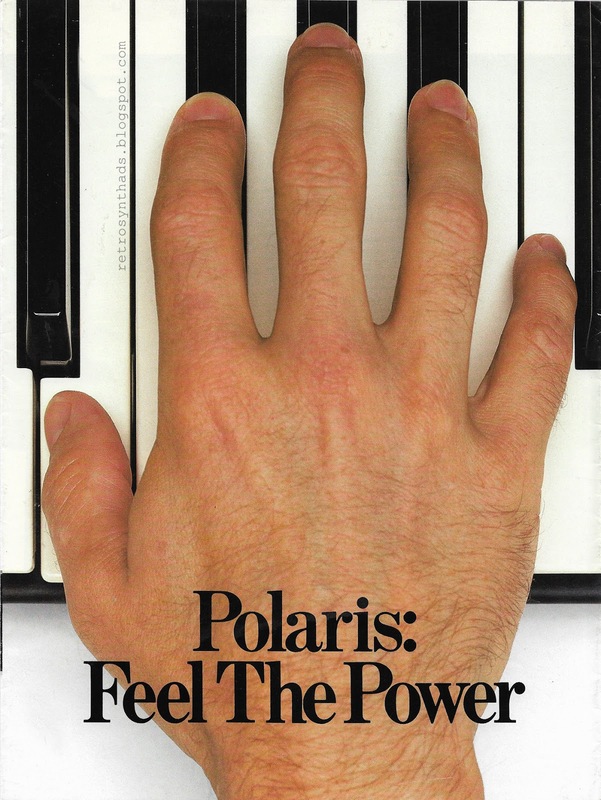 "Polaris: another engineering triumph of our leading-edge synthesizer 'think tank'." 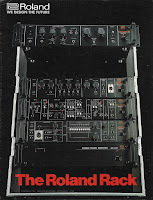 I want to be a member of a synthesizer think tank. 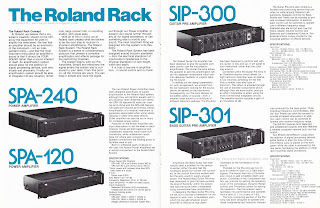 Roland "The Roland Rack" eight page catalog including SPA-240, SPA-120, SIP-300 and SIP-301 amplifiers, SDD-320 Dimension D, SBF-325 stereo flanger, SVC-350 vocoder, SPV-355 pitch-to-voltage synthesizer, SRE-555 chorus echo, SMX-880 line mixer, SST-120 sound system, and SEQ-315 and SEQ-331 equalizers from May 1980. 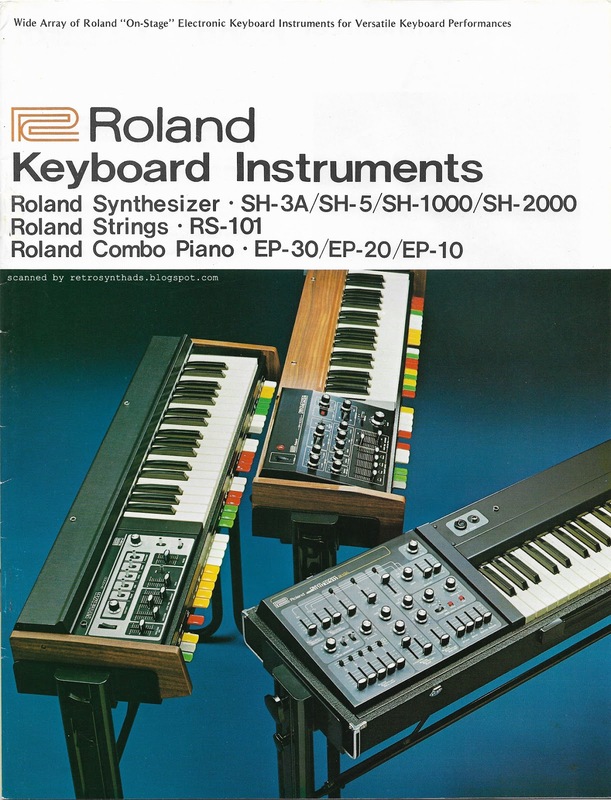 Oh man... after scanning that last Roland catalog, I just couldn't stop. I became a whirlwind of scanning... and this one got caught up in the tornado. Okay - a glass or two of wine might have helped too. 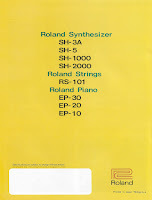 Point is - the result is another excellent Roland catalog for the blog! As a teen I always ran into these racks in pawn shops. They looked awesome but I just couldn't afford them. That's not exactly true... 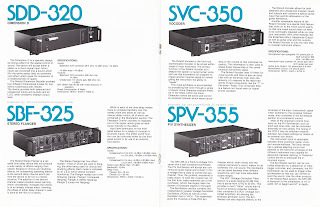 I did end up finding a SVC-350 locally back in the 90s. Snapped it up immediately and its never left the studio. But there is just so many other racks from this series that I want. Unfortunately prices have gone through the roof on most of 'em, so it's just a fantasy to find them all now. See... what I tell ya. Wouldn't that thing look great filled with all those rack units?!?! I've expressed it before, but it can't be said enough. I. LOVE. ACCESSORIES. 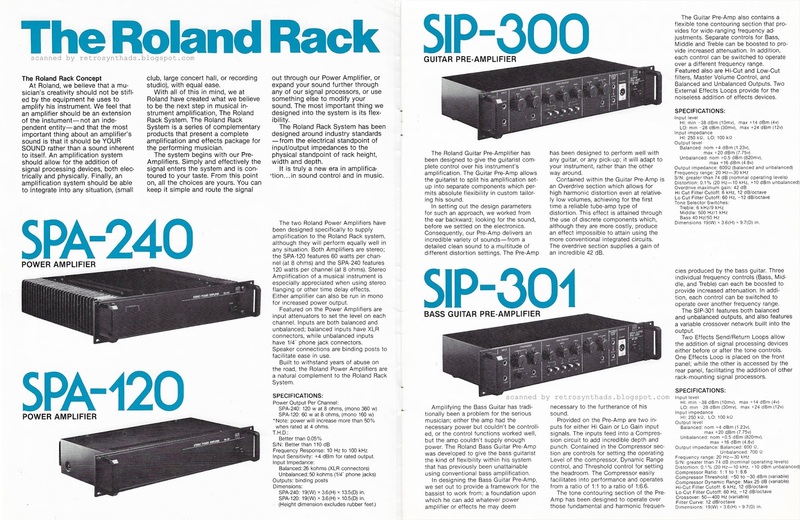 And this Roland Rack is on the top of my "want" list. I have never seen one of these in someone's gear shot or in an advertisement. But I want to. If you have one of these, please snap a photo and send it to me! I will add it to the post with a link back to your page/bandcamp/wherever! 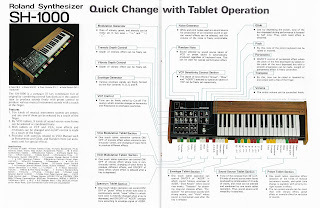 End note: Did you find the System 100 synthesizer? 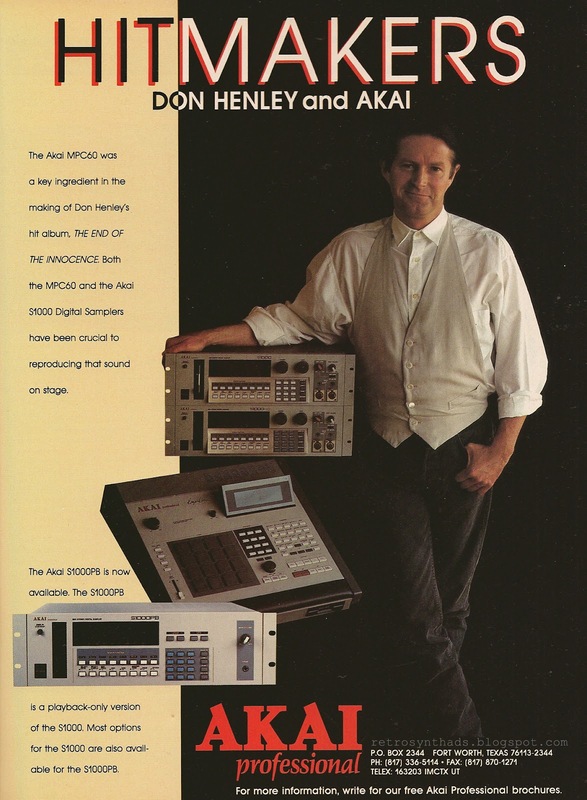 MPC60, S1000, S1000PB "Hitmakers: Don Henley and Akai" colour advertisement from page 23 in the December 1989 issue of Keyboard Magazine. And in 1989, Akai did good when they nabbed Don Henley for this long running advertisement. His album "The End of the Innocence" was Grammy nominated for Song of the Year, Record of the Year and Album of the Year... and WON for Rock Male Vocalist. Not too shabby. Although this second Keyboard Magazine ad for the MPC60 didn't appear in the mag for well over a year after Akai's first introductory ad in the February and March 1988 issues, the MPC still managed to pop up every now and then. 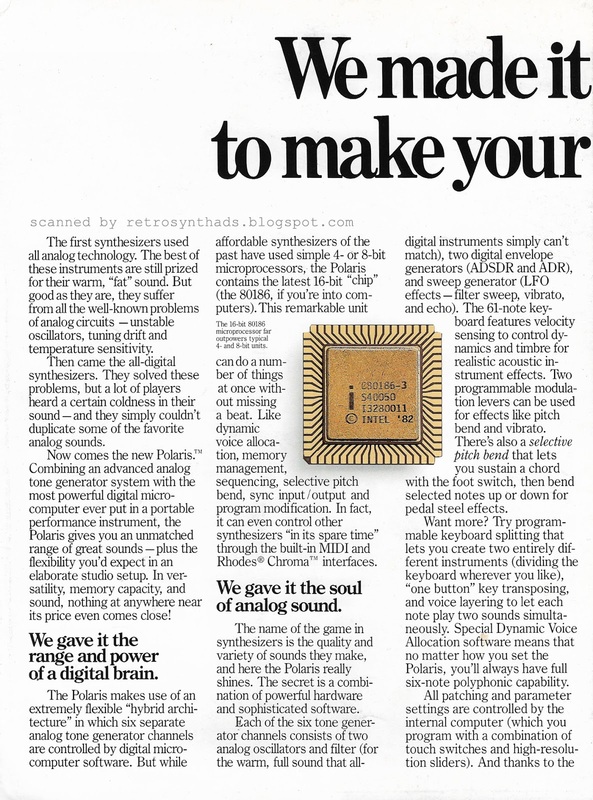 For example, right after that first ad ran, the MPC60 appeared the following month in an April 1988 NAMM article. "The Akai booth was really dancing, with Roger Linn demonstrating the MPC60 ($4,995.95), featuring MIDI sequencing and drum machine sampling. 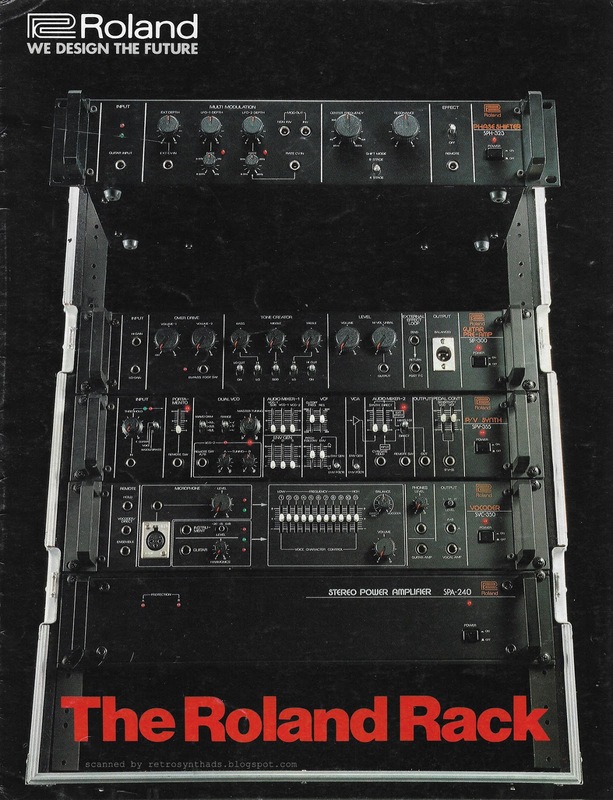 Detailed in-depth in our Summer 1987 NAMM coverage (Keyboard, Nov. '87), the MPC60 (formerly known as the ADR15 Drum Machine/Sequencer) is now available." And if you read the blog post about that first ad, you'll recall that the MPC60 was also highlighted in Keyboard's November '87 NAMM show article as well. That's right - it received some great double exposure for showing at two different NAMMs. 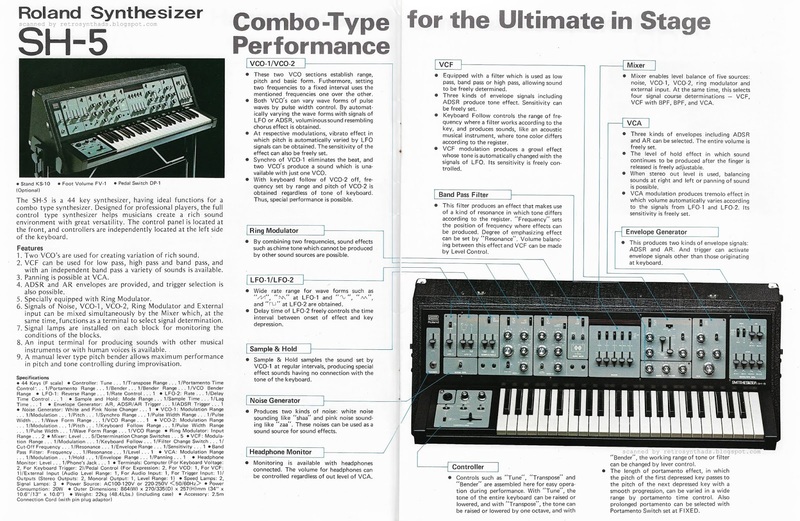 In November 1988, the MPC60 finally made it into the Review section of Keyboard Magazine. 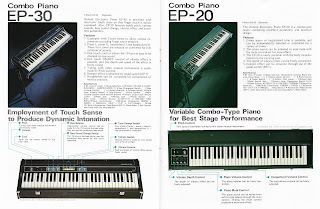 The extensive write-up weighs in at over five pages and covers a lot of ground that included an introduction that wears Keyboard reviewer Freff's uneasiness on his sleeve. Remember - this was really the beginning of what could possibly a whole new market. "We should admit our own conflicting reactions up front. 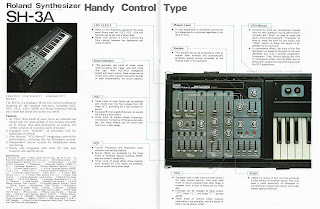 Our very first thought, upon examining the MPC60, was why? Why even design, let alone try and sell, a three-in-one unit like the MPC60 when the marketplace is awash in inexpensive drum machines, samplers and sequencers (both software- and hardware-based)"
"Our second reaction, upon using the MPC60 for several days, was Oh, of course - that's why. It is an unquestionably professional piece of gear in its attention to conception, design, and execution. It looks good and feels even better: It is, in fact, a tactile pleasure to play and to program. These are qualities that have been given short shift by manufacturers in recent years, and we're happy to see that the trend might be reversing." There ya go... I know I feel much better. You? 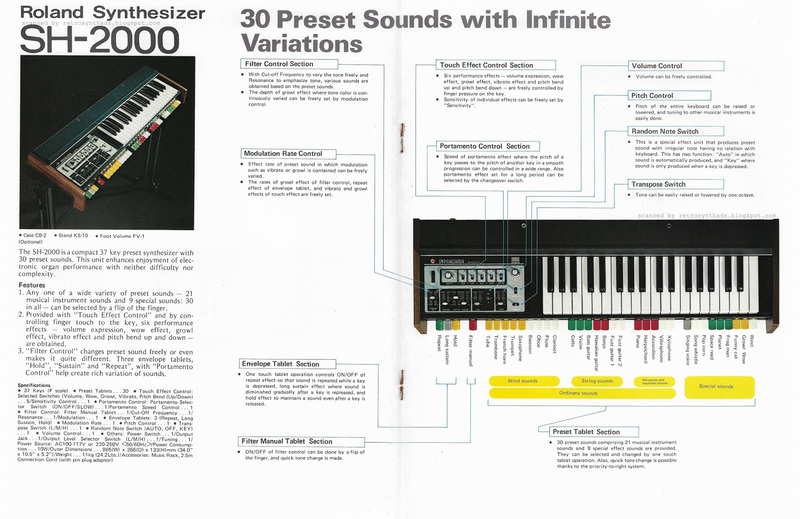 And finally, the MPC60 popped up again in the March 1989 issue of Keyboard. Twice. 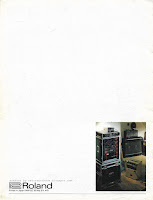 The first appearance was that Akai Michael Jackson advertisement that I blogged about just a bit ago. And the second time was when the magazine tried its darnedest to come up with a way to comparatively test over a dozen different samplers. Although it didn't make the cut for the dozen or so samplers that they did test, there is a great section called "Features Chart" that does include the MPC among 30+ other samplers. Especially since its descendants have outlasted most of pack. 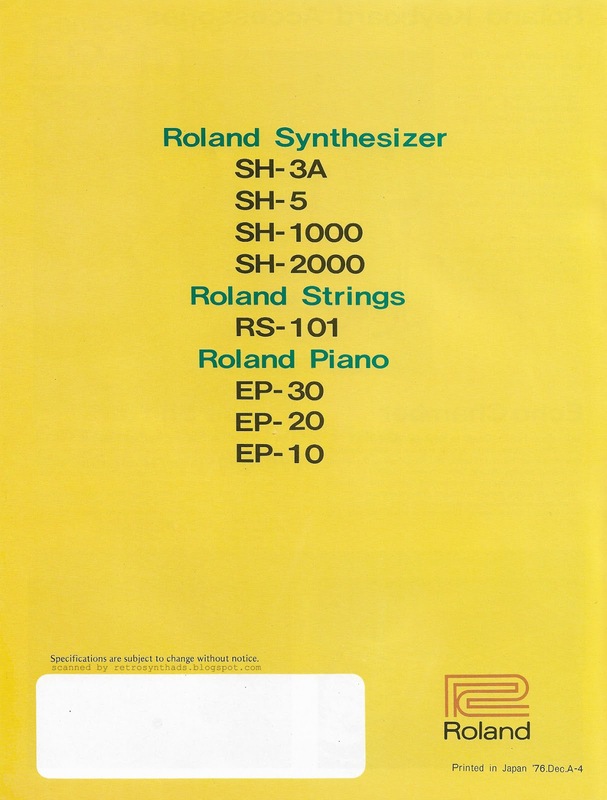 Roland "Keyboard Instruments" 16 page colour catalog including SH-3A, SH-5, SH-1000 and SH-2000 synthesizers, RS-101 strings instrument, and EP-30, EP-20 and EP-10 combo pianos from December 1976. Well... time for a bit of a break from the Akai MPC stuff. And I thought, since this year marks the 10-year anniversary of the blog (I know... right?!?!?) I wanted to post something special so I've dug into my archives. A quick look online didn't bring up any good scans of the English version of the catalog (I did find scans of the Japanese version online), so I figured this was a good candidate. 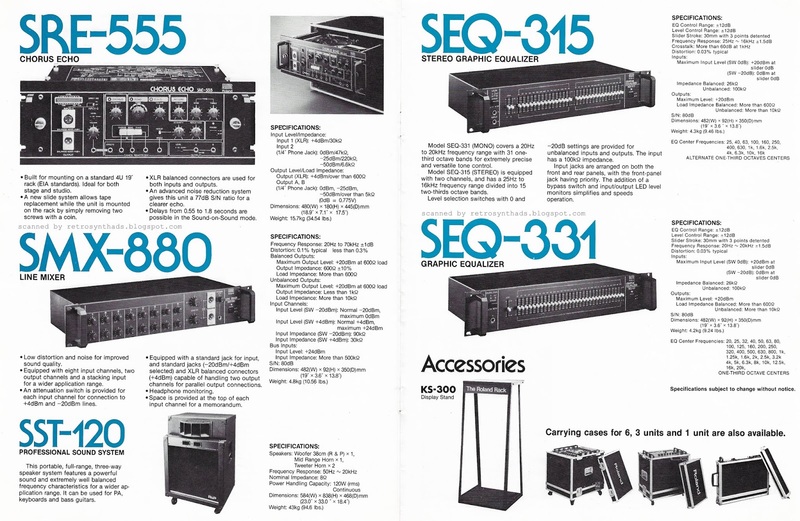 I love Roland's catalogs from this time period - they did everything right. Always a nice cover image. 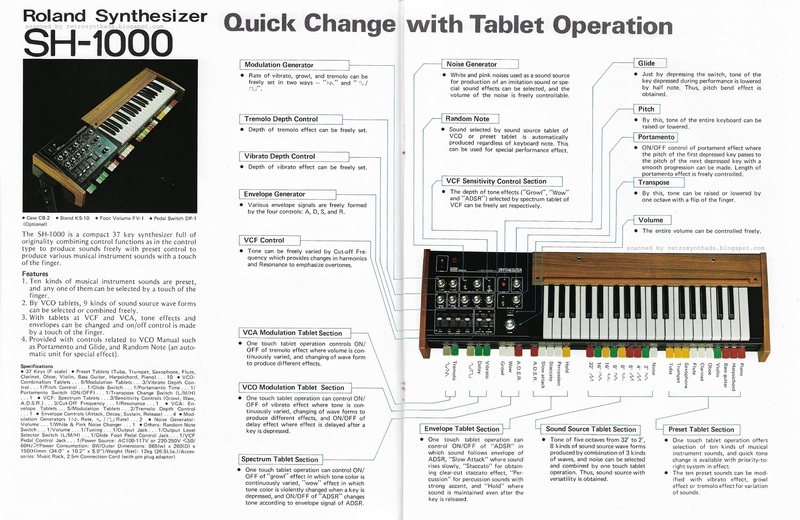 And highlighting each keyboard's features are large photos turned into diagrams. Each page includes lots of white space and simple, readable fonts. In particular, I'm really digging those two pages dedicated to the SH-5. 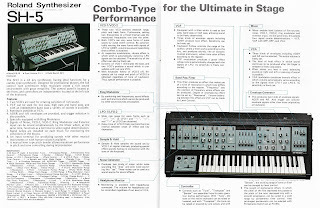 It's one of the few synths still on my bucket list. 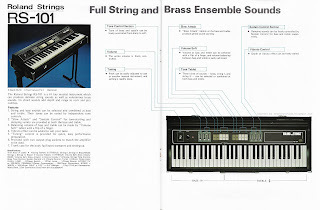 The synth itself has only popped up on the blog twice... once in a Roland retail price list, and the other is this memorable "Groupies aren't everything" advertisement from International Musician (right). The other section of the catalog that really got my attention was the half page dedicated to Roland's keyboard accessories. I love vintage accessories and will often go out of my way to hunt them down. Cases, bags, pedals... all of 'em. 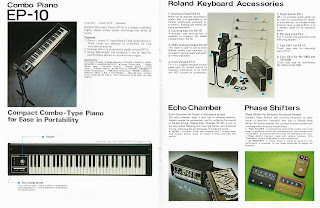 And now I have my eye on two more - that KS-10 keyboard stand and carry bag. 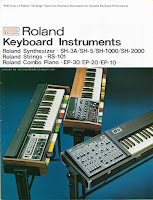 Un-frickin'-believably... Roland has kept the KS-10 name alive in their KS-10x keyboard stand. Seriously - over 40 years later! You can find a better photo of the original KS-10 here. Dang... that's some sweet hardware, don't you think?!?! 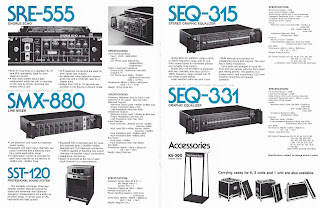 I've got a few more catalogs to post... hopefully sooner rather than later. We'll see.